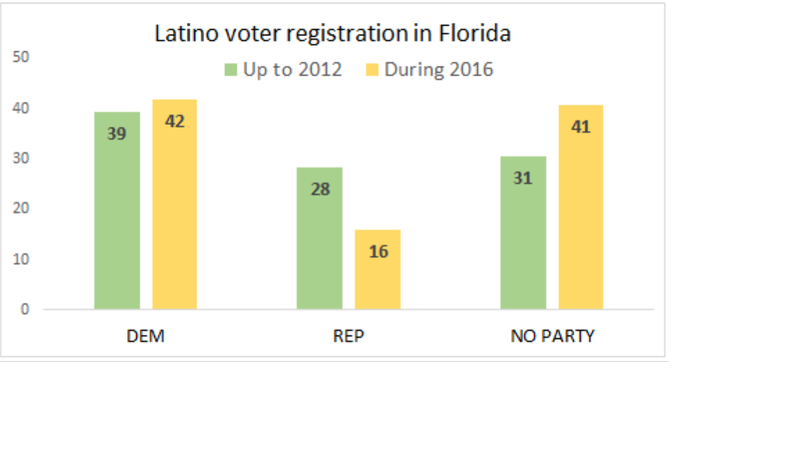 Voter registration data in Florida over the past three-plus years show a dramatic shift in the partisan identities of Sunshine State Hispanics. The data suggest a potential sea change in the partisan commitments of the fastest-growing voting block in what remains a pivotal swing state in presidential elections. As of August 1, 2016, there are 2.1 million Hispanic registered voters in Florida, according to designation on voter registration forms. Among Hispanic voters, more than one in five are newly registered voters who were added to the voter rolls since the 2012 presidential election. Between January 1, 2013 and August 1, 2016, 441,508 Hispanics registered to vote and remain in the statewide voter file. And according to state records they are trending more heavily Democrat in 2016 voter registration than ever before. Since January 2, 2013, over 166,000 new Hispanics registered as Democrats, accounting for nearly 38 percent of the total, and some 66,000 new Hispanics registered as Republicans, accounting for 15 percent of the total. 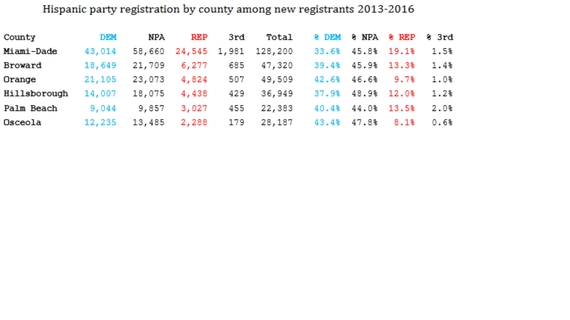 That advantage of 100,000 more Democrats over Republicans is even more pronounced when looking just at registrations in 2016. Since January 1, 2016, 42 percent of all new voter registrations among Hispanics were Democrat, compared to 16 percent among Republicans. For comparison purposes, of the 1.65 million Hispanics on the voter rolls who registered prior to 2013, 39 percent (652,000) were Democrats, and 28 percent (470,000) are Republicans. Overall, party registration went from an 11-point Democratic advantage prior to 2013, to a 26-point advantage in 2016. 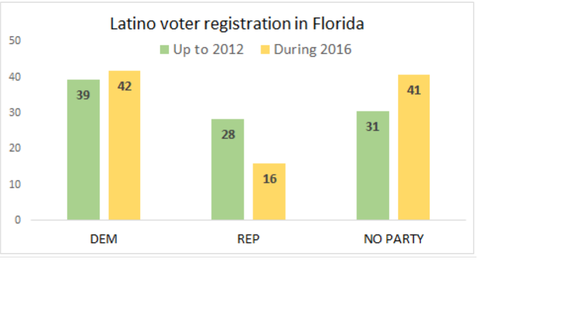 Still, a large percent of Hispanic voters in Florida choose the option for no party affiliation (NPA), at around 34 percent statewide. As of August 1, 2016, of the 441,509 Hispanics on the statewide voter rolls who have registered over the past three-and-a-half years, 177,000 (40 percent) are between the ages of 18 and 29. 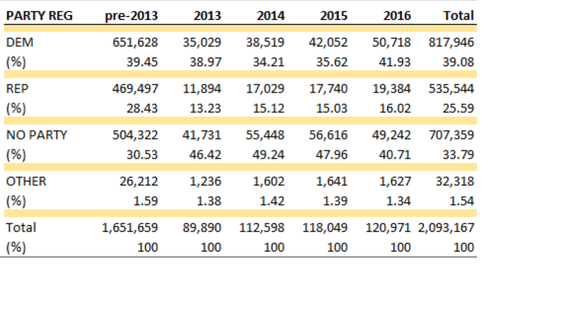 Another 111,000 (25 percent) are 30-44 years old, some 98,000 (22 percent) are between 45-64, and 40,000 (9 percent) 65 and over (with the balance under the age of 18 (preregistered), over 105 years old, or with their birthdays redacted in the voter file). Among the 177,000 new Hispanic voters age 18 to 29, 36 percent registered Democrat, 14 percent Republican, and 50 percent as no party affiliation or another party. In Florida, 76 percent of the 2.1 million registered Hispanics reside in just six of Florida's 67 counties: Miami-Dade, Broward, Orange, Hillsborough, Palm Beach, and Osceola. 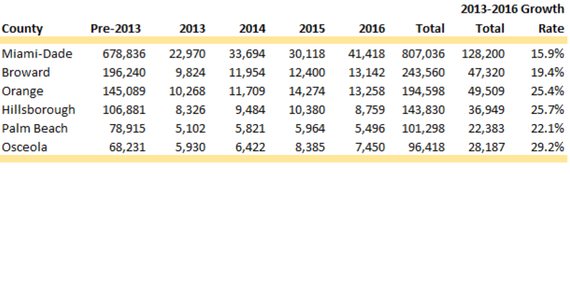 The table below provides the current registration figures ("Total") by county for these six counties, as well as the number of Hispanics who registered in each of the previous three-plus years and those prior to 2013. 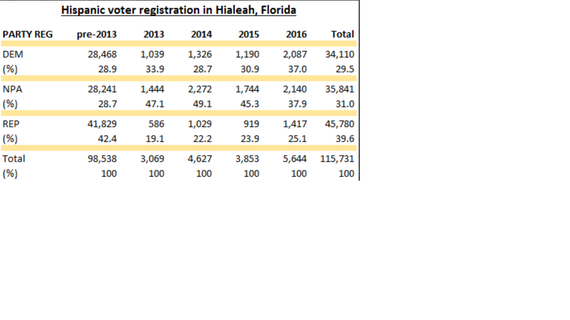 As the data indicate, Miami-Dade has by far the highest total number of registered Hispanics (807,000), as well as the highest number of recent (2013-2016) Hispanic registrants with 128,000 new registrants. However the growth rate is lower in Miami than in the other large Hispanic counties. Hispanics who registered in the previous three-and-a-half years in Miami-Dade comprise only 15.9 percent of all registered voters in the county. In contrast, the 28,200 recently registered Hispanic voters in Osceola comprise 29.2 percent of the county's 96,400 registered Hispanics. These data suggest a notable shift in growth of Hispanic voters in Central Florida. What's more, the Democratic advantage over Republicans is apparent across all six major counties, including Miami-Dade, once regarded as a Hispanic Republican stronghold. New Hispanic voters in Miami are +14 Democrat. 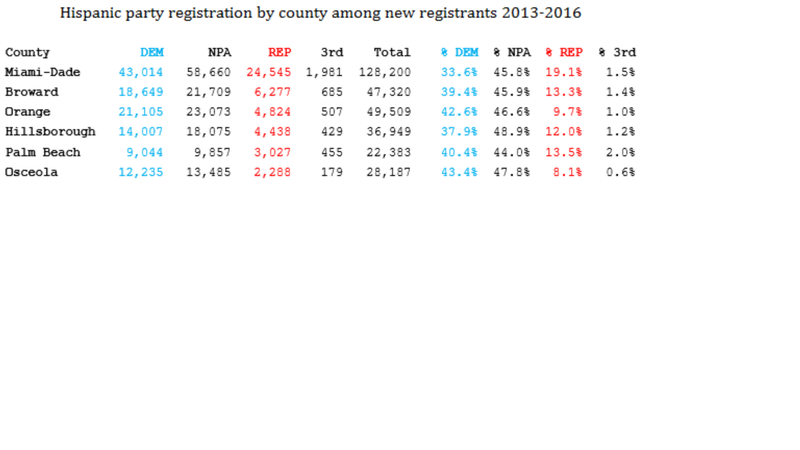 However, the largest Democratic advantage is found in the two Central Florida counties of Orange and Osceola where new Hispanic registrants prefer Democrats to Republicans by more than 30 points. 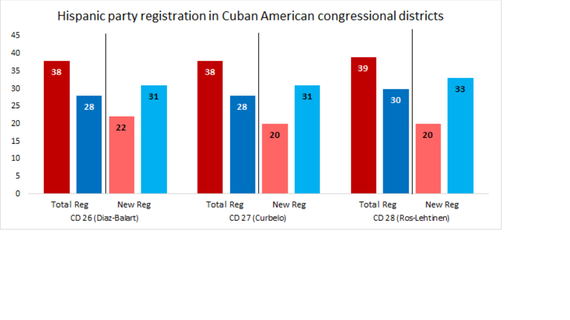 Party registration reversal among Cuban Americans? 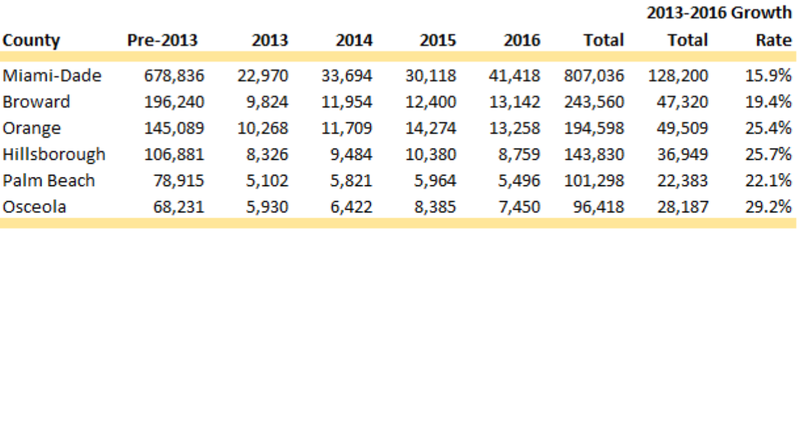 Because it accounted for fully 29 percent (128,000) of the newly-registered Hispanics, Miami-Dade deserves a deeper look. As indicated in the table above, roughly 43,000 (34 percent) of the 128,000 newly-registered Hispanics in the county are Democrats; 59,000 (46 percent) indicated no party, and the remaining 25,000 (19 percent) are Republicans. Miami-Dade includes portions of five congressional districts, including large swaths of three majority-minority Hispanic districts (CD25, CD26, CD27), all of which are currently represented by Cuban-Americans. Of the 251,000 Miami-Dade registered voters who reside in the newly drawn D25, 209,000 are Hispanics. Of these, 38 percent are Republicans, 32 percent are NPAs, and 28 percent are Democrats. Roughly 16 percent of the 209,000 new Hispanics in the district registered since January 1, 2013, and they split 22 percent Republican, 46 percent NPA and 31 percent Democrat. Of the 367,000 Miami-Dade registered voters who reside in the newly drawn CD 26, 243,000 are Hispanics. Of the Hispanic registrants, 38% are Republicans, 32 percent are NPAs, and 28 percent are Democrats. Roughly 16 percent of the 243,000 Hispanics in the district have registered since January 1, 2013, and they have registered 20 percent Republican, 47 percent NPA and 31 percent Democrat. Of the 420,000 Miami-Dade registered voters who reside in the newly drawn CD 27, 239,000 are Hispanics. Of these, 39 percent are Republicans, 30 percent NPAs, and 30 percent are Democrats. Roughly 15 percent of the 239,000 Hispanics in the district have registered since January 1, 2013, and they have registered 20 percent Republican, 45 percent NPA and 33 percent Democrat. Finally, Cuban-Americans comprise roughly 75 percent of population of the City of Hialeah in Miami-Dade County. Currently, there are roughly 140,000 registered voters in Hialeah; 118,000 identify as Hispanic. Of these 118,000, 39.6 percent are Republican, 31 percent NPA, and 29 percent are Democrats (approximately 3,000 identify with some "other" party). 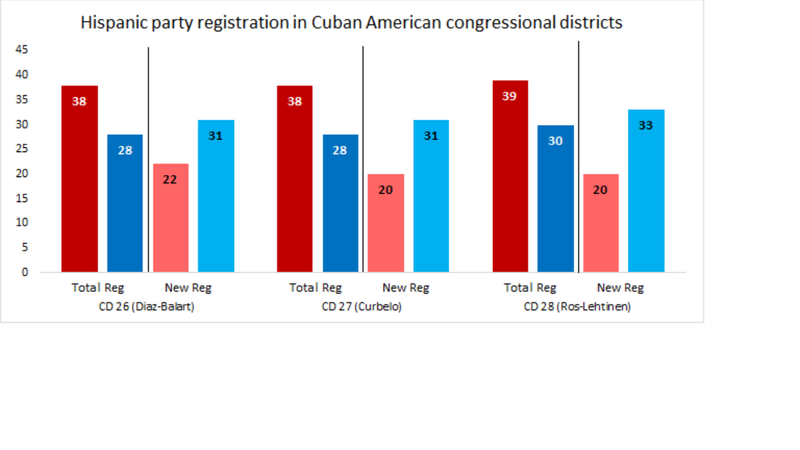 Since January 1, 2013, 17,858 Hispanics have registered in Hialeah: 23 percent as Republicans, 44 percent as NPAs, and 32 percent as Democrats, suggesting a reversal in party identification and affiliation among Cuban Americans. 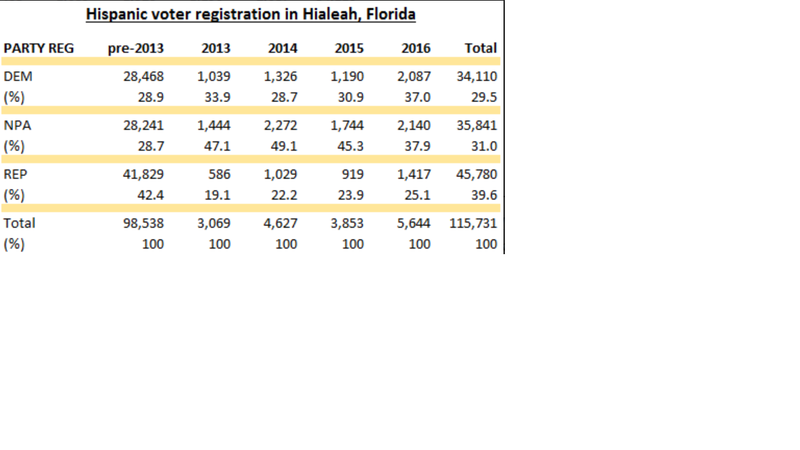 The table below provides the breakdown of these party registration trends of Hispanics before and every year since 2013 in Hialeah, a majority-Cuban city in Florida. Prior to 2013 Hispanic voter registration was 42 percent Republican and 29 percent Democrat, a GOP advantage of 13 points. As of 2016, there is a striking reversal in partisan identification, with 37 percent Democrats and 25 percent Republicans--a net Democratic advantage of 12 points. 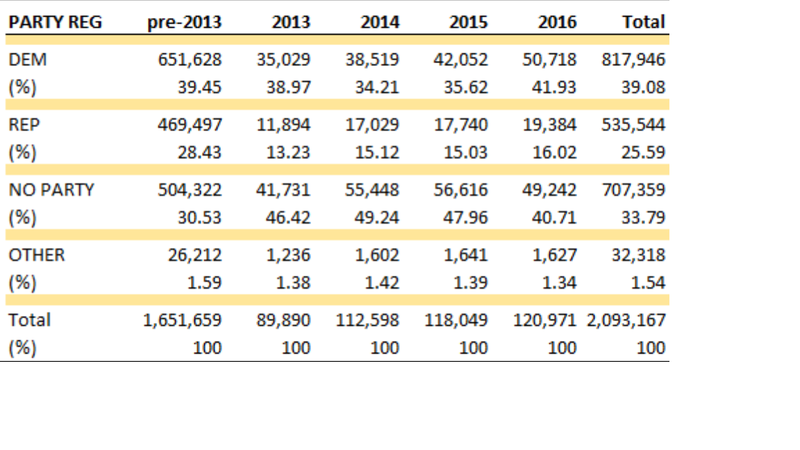 Although this advantage is most pronounced among Hispanic millennials in Hialeah, the Democratic advantage is apparent in every single age-cohort of new 2016 registered voters. Hispanics aged 18 to 29 are registering 38 percent Democrat to 18 percent Republican, which is largely consistent with youth registration patterns prior to 2013. More interesting is the fact that Hispanics aged 65 and over registered 36 percent Democrat to 33 percent Republican, a sharp reversal from their 23 percent Democrat to 59 percent Republican registration prior to 2013. South Florida Hispanics continue to be more Republican than Hispanics in the rest of the state and nation. But partisan attachments in Miami-Dade and other Florida counties with significant Hispanic populations indicate a significant shift away from the Republican Party. In five weeks, we will learn what effect these registration patterns had on the battle between Hillary Clinton and Donald Trump for Florida's 29 electoral votes, Republican Sen. Marco Rubio's re-election bid against Democratic challenger Patrick Murphy, and key congressional races. Dr. Daniel A. Smith is Research Foundation Professor of Political Science at the University of Florida. He has published more than forty scholarly articles and book chapters on politics and elections in the American states in the leading political science journals, including the discipline's most esteemed outlet, The American Political Science Review. A seasoned observer of ballot initiative and candidate campaigns around the country, as well as elections, voting rights, and redistricting in Florida, Professor Smith's commentary has appeared in or has been heard on numerous news media, including The New York Times, The Wall Street Journal, The Economist, USA Today, The Washington Post, The Los Angeles Times, BBC, National Public Radio, Voice of America, and ABC and NBC News. Professor Smith has provided testimony to Congress, the state legislatures of Colorado and Florida, and the British House of Lords.